Finding interesting microcontroller-driven gadgets is a big part of my job as The New Stack’s resident hardware hacker. 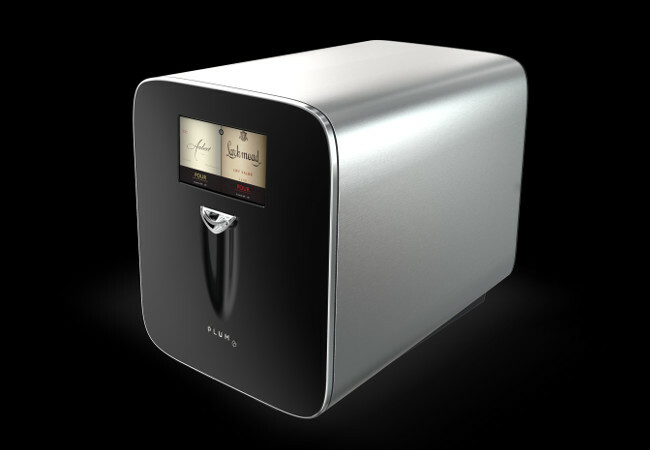 While wandering around the Embedded Linux Conference last month, I met Mike Dumont, a software engineer for Plum, a company building a super-automated, wine-dispensing appliance. The soon-to-be-available retail product utilizes much of the physical computing stack, as discussed here at Off-The-Shelf Hacker. Dumont, and his engineering associate, Angelo DiNardi, filled me in on the particulars of the Plum in a follow-up phone call. It bothered David Koretz, Plum’s founder, to have to pour expensive wine down the drain when he and his guests didn’t finish a bottle in just one sitting. Wine quality deteriorates when it’s exposed to oxygen and reinstalling the stopper simply can’t halt the process. Koretz observed that making coffee at home went from hard to easy with the advent of the automatic coffee maker. Why not apply the same principle to pouring a glass or two of wine at a time at the right temperature and then not have to worry about wasting what remained in the bottle? So he started developing a machine in his home to provide a much better experience for both connoisseurs and everyday wine drinkers. 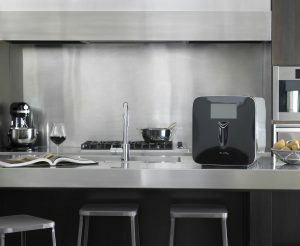 The resulting appliance holds two separate 750 ml bottles of your favorite vintage. You just open the device and place the bottles inside which are angled downward at 55 degrees. The machine uses cameras to read the labels, then queries the cloud for information on your selections, chills the bottles to the appropriate temperature and deftly taps the bottles. Using a patented “needle in a needle” design, no oxygen enters the bottle and you certainly don’t have to bother with corkscrews or any of that kind of thing. The machine then keeps the wine in top shape using inert argon gas for up to 90 days. The argon cylinder is refillable and preserves up to 200 bottles of wine. Check out the animation of the machine’s operation. The Plum is available for $1,499, in pre-order. That’s retail, from a real company, not just a Kickstarter project. Customer delivery is advertised as Spring 2017. Dumont and DiNardi explained that the Plum uses Yocto Linux on a Raspberry Pi 3 microcontroller. The machine is WiFi enabled and understandably has a good bit of custom hardware to drive the solenoids, valves and bottle-handling machinery. The company spent hundreds of hours creating the internals and spared no expense to achieve the highest quality construction. Flow meters and other sensors keep tabs on dispensing and precisely control the bottle’s condition. Since wine enthusiasts, by definition, require high quality, Plum reflects that commitment to its products as well. Using a high-definition camera to scan the label gives the machine the ability to know the type, variety, dispensing parameters and even the winery of each bottle. Knowing little bits of obscure information about a certain bottle of wine adds to the fun and is an important part of becoming a wine aficionado. Providing rich content about individual bottles creates a virtual wine tasting room, around the device. This is the “cool user experience” side of physical computing. Could you use this emerging trend for your projects? We didn’t go very deeply into the software development aspects, although Dumont acknowledged that Linux and container technology were widely used. He also said that extensive testing was performed using mock hardware ranging from solenoids, switches and the microcontroller all the way up to the full-scale prototype machine. Yes, a certain number of bottles of wine were sampled. All in the name of quality testing, I have to assume. Of course, you’d absolutely know that I’d ask about hacking the device. Dumont said Plum doesn’t support mods, citing the inherent dangers of using compressed gasses and such. My take is that readers can derive inspiration from Plum’s well-thought-out design and perhaps apply a few of the concepts to their own projects. Seeing actual physical computing stack examples like the Plum keeps Off-The-Shelf Hackers motivated and the creative thought process going at full-speed. Clearly, the Plum isn’t for everyone. If I regularly bought $300 bottles of wine, I’d probably get one. The last few years have definitely seen an uptick in wine collecting. The “hobby” seems to be growing. Who doesn’t like spending a pleasant afternoon touring a winery and sampling an exquisite glass of vino? The company’s website also mentions that one of their target markets is the hotel industry. Here’s a drop-in Internet-of-Things type of device that is easily integrated into the hotel room promotional and billing model. This style of lateral market thinking, although subtle, is a prime driver of today’s physical computing stack.